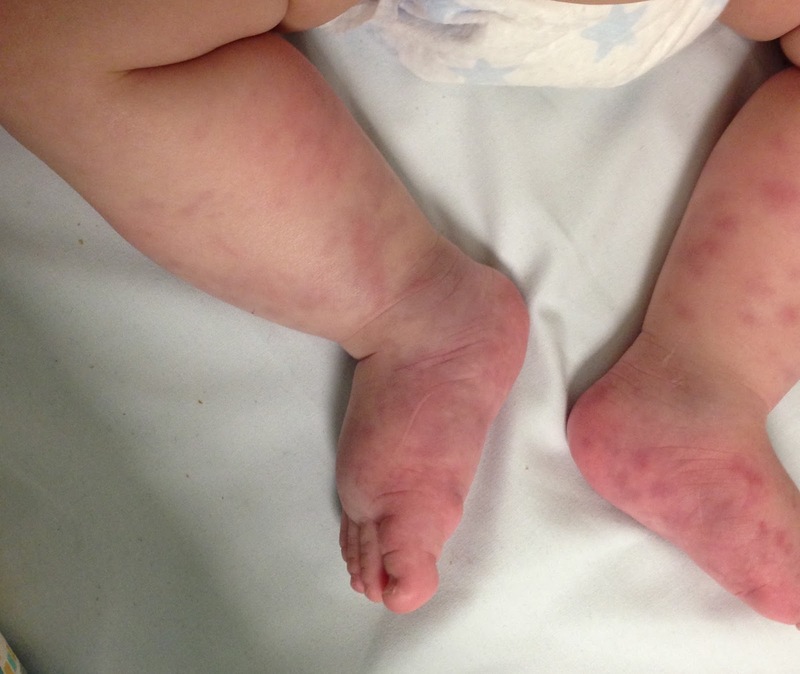 One day Seb's legs, from the knee down, suddenly swelled up and had red blotchy/rash type symptoms with bruising around the ankles. When the red spots/blotches were pressed on they did not disappear. Our GP didn't really know what it was but feared it was Meningitis so they gave him a shot of Penicillin. At this point, I had no idea what Meningitis was. (update - Medicines like Penicillin actually could worsen symptoms of HSP). By the time the Paramedics arrived Seb's legs were red and hot to the touch and also developed some white raised spots with redness around them. It was looking like it could have been insect bites. The rash was changing all the time. I was in such a rush to the doctors I didn't even get Harvey any shoes. Seb had no milk. We had no food. I didn't know who to call. We were in the hospital for over 9 hours before my husband made it in. It was the scariest day of my life. Rash also on soles of feet. Was hot to the touch. After a blood test and a dose of antibiotics, Seb was admitted into the hospital overnight for observation. At this point, they still didn't really know what it was as Seb only showed a few signs of any possible causes and oddly only in his legs. But the main thoughts were Meningitis or Henoch-Schönlein Purpura. Henoch-Schönlein Purpura (HSP) is a condition that causes small blood vessels, to become swollen and irritated. This inflammation, called vasculitis, usually occurs in the skin, intestines, and kidneys. The symptoms are A skin rash (purpura) that looks like small bruises or reddish-purple spots, usually on the buttocks, around the elbows and on the legs, and sometimes also on the face and upper body. Joint pain (arthritis) such as the knees and ankles, which also become swollen, tender and warm. Tummy pain, which tends to come on after the rash has developed but can occur beforehand. Symptoms can last for about four to six weeks. It can reoccur after the child has another cold or viral infection. Although no one really knows what causes Henoch-Schönlein Purpura it seems to be triggered when your little one has had a bacterial or viral infection of the sinuses, throat, or lungs. Which seems to tie in with Seb as he had a throat infection over a month ago. Other triggers are things like medicines, food reactions, insect bites, and vaccinations. There doesn't seem to be any real cure for HSP and doctors only recommend the usual Calpol for any pain relief. Do not to give them Ibuprofen as it will make symptoms worse. So for 5 days Seb had to go back to the hospital to have his shot of antibiotics until his test results for Meningitis came in. Everything came back negative and so the conclusion is that it was Henoch-Schönlein Purpura The rash has disappeared and Seb seems fine. But we have to go back for check-ups for the next 3 months in case it has affected his kidneys. 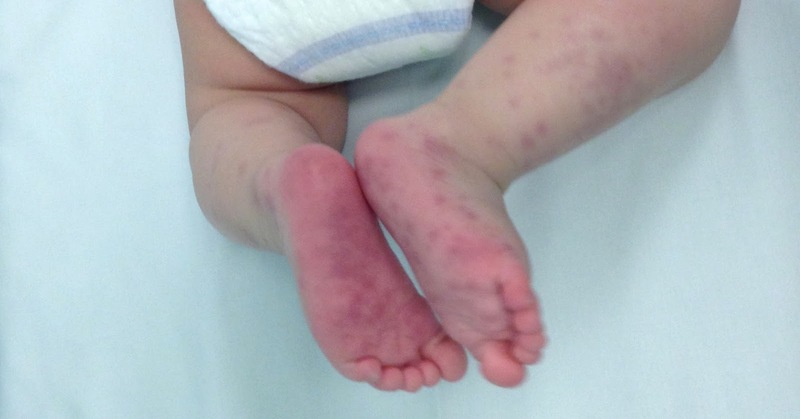 I still don't believe Seb had Henoch-Schönlein Purpura as he only had the rash and swollen legs as symptoms and none of the others. I guess we will never know. But I am grateful to our GP and the men and women in A&E for their quick response and help in looking after Seb. So if your little one shows any symptoms of swollen limbs, blood in the nappy, stomach cramps, and is not well in themselves and especially when the spotty rash appears and won't disappear when pressed. Don't hesitate and go straight to A&E. My son first got this when he was 5 years old. He had been fine all day except for a chest cold so I went ahead and went to work but when I got back home and went to put him to bed and he cried and said his legs hurt. My ex-husband said not to worry about it, he was just making excuses to not go to bed, but I knew something was wrong. So of course I examined his legs and found the spots just on the lower parts and his ankles were swollen and looked like bruising on the bottoms of both feet. I rushed him to the hospital and the doctors ran tests and found nothing, but gave him some antibiotics and in about 2 weeks he was better and the rash was gone. One doctor told me their best guess was severe strep that causes trouble with the kidneys which in turn caused trouble with everything else and we did a check up a month later and he was fine. I searched everywhere on the internet looking through so many diseases I had no idea even existed until I was able to find HSP and was finally relieved to be able to put a name to it. I told the doctor but they did their testing and found nothing wrong. 3 months later, he got another chest cold. This time not taking anything to chance, I kept him out of school and in bed, taking medicine and lots of rest. The spots came again but not as noticeable and he was better with in a week. Then he went a whole year and no rashes or swollen legs even though he's had another cold. So I thought maybe it went away for good. But he's 7 years old now and after getting home from school he started complaining his legs hurt and yes, he has another cold. I gave him medicine and put him straight to bed. Haven't seen any spots yet but his ankles were starting to swell. I'll be taking him to a different doctor this time to try to see what else I can do for him. I just don't understand how this can pop up out of nowhere and then lay dormant for a year and come back again. I can't find any connection to it. He's not allergic to anything. The first time it happened was in Sept. 2012, and now it's possibly back again and it's March 2014. Anyways, didn't mean to ramble, it's just nice connecting with someone who's gone through the same thing. Hi Holly, thanks for sharing your story! The doctors still don't know what Seb had but their best guess is HSP. It not only appears on the legs but also arms and bottom. Plus also check for bleeding in the nappy, or in your case undies :D, as it can affect the kidneys. I was speaking to my mother in law this weekend and she said Steve also had a form of Purpura when he was younger! So I wonder if it is genetic as well? Will have to do further research! Thanks again for sharing! I know it can be frustrating and scary when even the doctors have no real idea! Hi Holly, How is your son now????? Any updates on how things are going?? Im just looking to get some positive feed, my son has had HSP since oct 28 this year and till this day it doesn't seem to be going away😓 The doctors tell me to just let it run its course and take him for follow up with his pediatrician but it just seems too long now. My son is 7 years old, he's got all the symptoms that come with the HSP blood in the stool, vomiting blood, púrpura rash, swelling in the feet, joint pain.. he was on steroids and it helped for a bit but it only made it worse the doctors think he might have developed an ulcer..he been hospitalized 3 times, 2 outta the 3 he was in for 2 days and the third time he was in for 5 days! Abdominal pain and joint pain is what's really hurting him..